As someone who was born and raised in Los Angeles, I like to think that I have a pretty good hold on what's going on in LA. Turns out I've been out of the loop on this very, very hidden restaurant called Nook Bistro in Santa Monica. Hidden is an understatement. Finding Nook was almost Club 33-esque. Tucked inside a tiny strip mall, is the minimalistic and modern restaurant. Here's a picture of the door. Inconspicuous, huh? I wasn't kidding when I said hidden. I think that adds to the appeal though. It's like a neighborhood secret you hear through the grapevine. I love it! The Nook Menu is misleading. They have an entire section called 'Small Plates' that aren't very small at all! This is a good thing as I really enjoyed my two small plates that I ordered. This Grilled Peach Salad was so good I wanted to lick the plate! Nook Bistro, if you are reading this, don't worry I didn't! I came pretty close to it though. The peaches were so sweet and grilled to perfection! Also, I love balsamic vinaigrette. It's my favorite dressing so that got high marks from me especially when mixed in with the mixed greens, feta, pickled red onion, and toasted almond. This is a must-order dish! What's so special about Crispy Brussels Sprouts, right? Uh, let me tell you! Crispy Brussels Sprouts with cilantro, mint and scallions all mixed into a sauce that is reminicient of Thai sauce. So what did I order for my entree? Spicy Gulf Shrimp & Grits with Logan's Turnpike Stone ground grits and linguisa sausage. Guys, go out and stand in line for this now. I'm drooling just thinking about this dish right now. I was also in the mood for some fish so I ordered the Pan Roasted Steelhead Salmonwild rice-kabocha pilaf, coconut emulsion. Oh my goodness, the pilaf was out of this world! 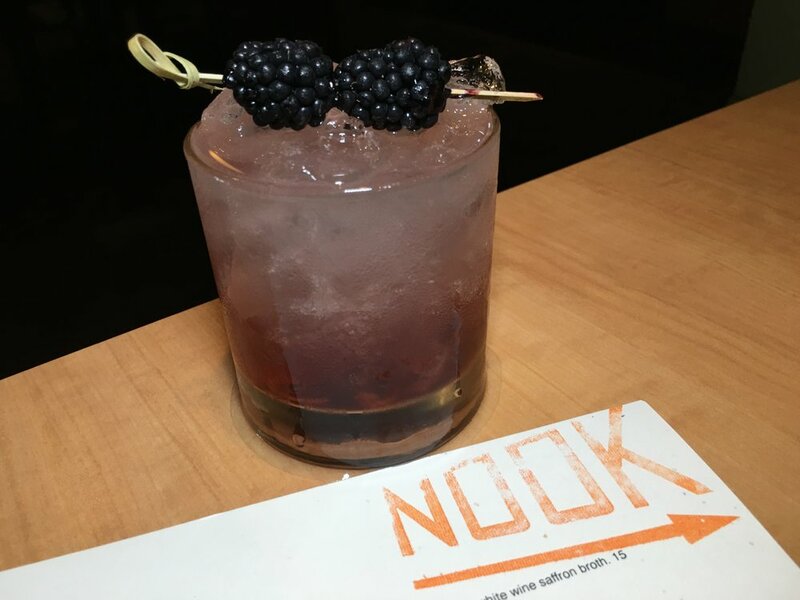 I'm admittedly not a big drinker, but I was recommended the Bramble with gin, lemon, blackberry liqueur from Nook Bistro is so tasty! In my mind, I could have had 3 or 4 of these. For the benefit of those around me, I only had one. Lol. I love a good fruity drink with a kick in it and this was it. This will be my must-order drink from Nook from now on. At this point, you can probably deduce that I was so full I had to be rolled out of Nook by the staff. It was at this crucial moment in my life that my wonderful server recommended the Rude Boy Sundae. What was this contraption? Could I even eat it? The answer was a resounding yes since everyone knows that dessert goes into another stomach. Fact. The fried plantains with hazelnut gelato, whipped cream, caramel, and walnuts was divine. No joke, if you haven't been to Nook Bistro you are absolutely missing out. The food wowed me. I've been telling all my friends ever since I finished that meal. Also Chef Andy does a $20 for a 3 course set meal on Sundays. It's not a set meal rather it's almost like his version of Nook omakase with whatever he's inspired with and whatever ingredients are freshest. The service was really on point and most importantly, they have an All Night Happy Hour with some fantastic specials that can be found on their website here. I didn't visit on a Sunday night so I definitely cannot wait to return and see what Chef Andy will whip up each week. Don't forget, Nook Bistro is only open for dinner. Bummer, right? You can find them tucked in the very corner at 11628 Santa Monica Blvd #9 Los Angeles, CA 90025, 310.207.5160 . Tell them I sent you! And don't forget to get the Grilled Peach Salad and Crispy Brussels Sprouts. Hell, don't forget the Shrimp and Grits, and the dessert too!